Against our better judgment, me and Eddie Cameron have made another Unity FPS for the Mini Ludum Dare #27, "All Talk." It's horribly unfinished because we spent most of the time playing LA Noire and going out to bars and eating amazing burgers, but hey, next time we'll know. 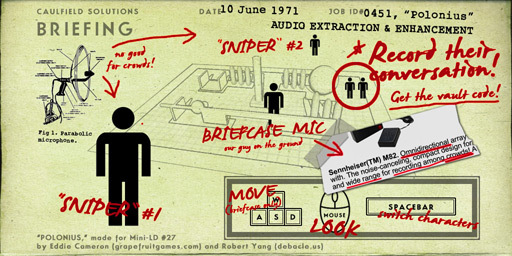 This game is based on the central setpiece of Francis Ford Coppola's classic espionage thriller, "The Conversation." Here's how it works: you have three characters with microphones. Two have long-range parabolic "sniper" microphones in fixed positions, and one is on the ground to actively tail the target. The target couple wanders into all kinds of obstacles (walls, trees, spheres, crowds) that prevents the snipers from getting a clear recording, so that's where the ground guy comes in -- he can tail them for a limited time, but then occasionally the target will turn around -- in which case he has to go run and hide. Right now a lot of it is broken and the game doesn't work as well as it should. Specifically, it's either really hard or it's too easy if you find one particular exploit. There's also a bunch of stuff we want to add: working gameplay, character animations, non-male character models, additional missions and scenarios, maybe a second "audio mixing" phase where you have to mix the 3 sources together before submitting to the client, etc. Still... I think we're slowly getting better at this. 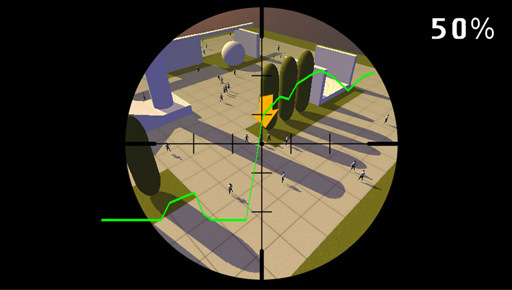 1) A yellow arrow hovers above your target for 30 seconds as an aid at the beginning of the game. After that, you're on your own. 2) Also, keep your briefcase guy out of the target couple's LoS, or else you'll lose! They have really far LoS! Just hide behind stuff to break LoS.